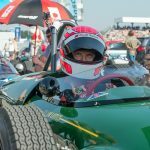 At this year’s Oldtimer Grand Prix at the Nürburgring, Marco Werner had a lot to do. Werner started with four cars in five races. After Hockenheim Werner started for the second time in FIA Lurani European Championship with the Lotus 22 used by Britec Motorsports, from the year 1962. In training he scored the third fastest time and started from row two. As always, the Formula Junior race showed a lot of action. “For me a little too much,” says Werner smiling after the race, “in the fight for second place, it turned me in the pouring rain on the straights and I went backwards at high speed in the meadow. I thought so I end up in the guardrails “. But Werner prevented an impact and fought his way back up to fourth place and thus won the invitation class. On Saturday evening was the highlight of the event of the Oldtimer GP, the race for GTs and sports cars until 1961. There was the four-time Le Mans winner; In 2016, Werner also won the Le Mans Classik on a Porsche 926, with two Maserati at the same time. He placed the Maserati Birdcage Tipo 63 from 1961 on the pole position. 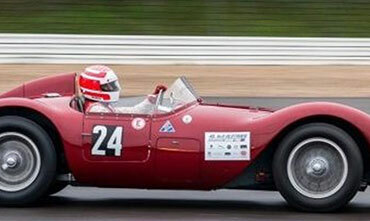 With a Maserati A6 GCS from the year 1955 it was about the class victory. Marco Werner started with the A6 GCS and led confidently in the class, as he directly took over the Maserati Birdcage Tipo 63 at the pit stop and driver change, which was in sixth place overall. Werner had to make up a gap of more than a minute. Marco Werner has not forgotten his rain skills of the past and took the lead in the one-hour race, partly with pouring rain. He built this sovereign and brought the Maserati Birdcage as overall winner before enthusiastic spectators finish. “That was fun,” he later wrote, “this is one of the most beautiful cars I have ever driven in historic sports. Top prepared by Mario Linke and his team Methusalem. Everything is going great. The car is awesome. It can drive well, has a mega engine and switches butter soft, just great, “beamed the winner. At the second round of the FIA ​​Lurani European Formula Junior Championship Werner had less luck this time. Already in turn one there was a touch with a competitor, in which Werner had climbed over the front wheel and had to give up with loose body. Werner also had little luck in the race of the sports cars, where he was called at short notice as partner of Dietmar Schröder in the Britec Motorsports supervised Lola T 290. Here one fought in the race with dropouts and finished the race early in the pits. “That was a shame, because in practice we were in ninth place with the little 2 liters in total, even though I was driving the car here for the first time and only had two practice laps. By car, something would have gone. But that’s the way it is with historic cars, things are not always running smoothly, “said Werner, disappointed.